Between platforms 8 and 9 at London Paddington. And there's 77 more of them! 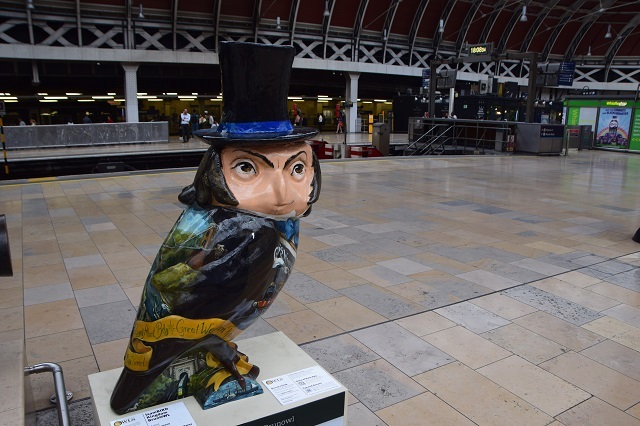 About the owl IsamBIRD Kingdom BrunOWL is the celebration of the famous inventor and engineer Isambard Kingdom Brunel. 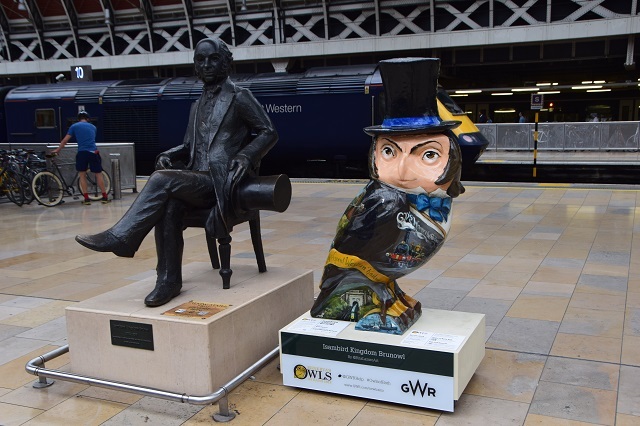 Apart from the characteristic top hat and tailcoat, the owl shows off some of his constructions. Rita, the artist, loves telling stories with her pictures and she has hidden a myriad of animals and mythical creatures all over the owl to make the learning more fun. Can you match all of Isambird's inventions on the ribbon with paintings on the owl? Can you spot the 10 little owls hiding among the famous landmarks? About the sponsor Great Western Railway (GWR) helps over 100 million passengers reach their destinations every year - across South Wales, the West Country, the Cotswolds, and large parts of Southern England. About the artist Rita has been working as a professional artist for over 15 years. She is an active member of Bath Artists Studio and have curated exhibitions with Fringe Arts Bath. She has had many solo and cooperative exhibitions of sculptures and paintings, the most recent of which was a sculptural medal exhibition in Beijing and Shanghai. 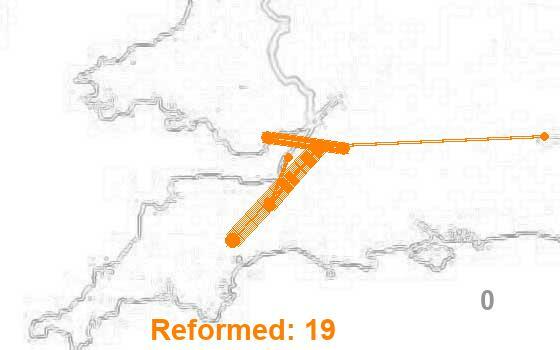 London Paddington, Platform 8 – June 21-July 31. Swindon station, Platform 3 Waiting Room – August 1-8. The owl statue was sold for £2,200 at a charity auction in Bath last night. A total of 61 went under the hammer, raising over £100,000. It wasn't Bignosemac who bought it was it? If he did buy it, he could keep it by the door for Finn to leave his mark on it. Personally I wouldn't have it in the house. (the owl, not Finn).